Yes, things are about to get very interesting. 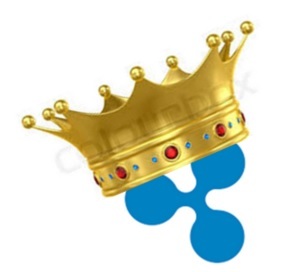 XRP ended 2017 by officially being crowned the "king of crypto returns." 1 Understand that Ripple didn't trumpet this from the rooftops, or linger too long on congratulatory news stories. Instead, they kept focused on the task at hand. The publishing of the fourth quarter XRP Report by Miguel Vias is imminent, and xRapid partnerships have become the focal point of the crypto side of Ripple's business. XRP will take the #1 spot in crypto in 2018. I say that based on my own research (always DYOR - do your own research), and also based on my understanding of some of the latest developments. Up until now - January of 2018 - the crypto market has been emotional and very reactionary. Some that have studied the movement of crypto from one investment to the next have noted that rationality and facts play very little role in the day-to-day surges and dumps of specific crypto-currencies; XRP is an exception. Instead of relying on a one-page whitepaper and an ICO, the team does things in a standard, methodical, and businesslike manner, doing the hard work of creating software, managing its governance, and working closely with banking customers. Did I mention that banks don't like to take risks? Yes, they're very conservative. 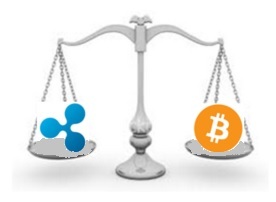 Even as Ripple has now been anointed 'successor to SWIFT' with the establishment of the SWELL conference,2 it was a qualified crowning of its digital asset XRP; in some of the SWELL sessions, banks noted that the regulatory environment around crypto-currency was still too uncertain for their taste. If you were like me, you were watching the livestreams of those panel discussions and were probably depressed to hear some of the comments. Let's be honest, we didn't expect crypto to be accepted with open arms by (arguably) the most conservative financial industry in the world - at least not at first glance. The next observation is more subtle, but much more impressive: Ripple didn't push the issue. Yet. 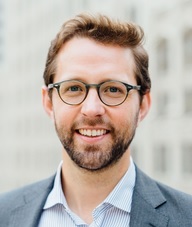 Instead, they went easy on the banks, and the closest that they got to talking about XRP was in the "The Real Deal with Digital Assets" where Patrick Griffin, Ripple Senior Vice President of Business Development, talked about the benefits of using xRapid for liquidity.3 Instead, for the first SWELL conference, they emphasized Ripple's continued focus on the interoperability of its various solutions for banks. It was very apparent to me that Ripple already anticipated banks dragging their feet when it came to the topic of using crypto-currency in place of fiat for Nostro accounts. Ripple knows they have two very different audiences; those of us that are early investors in XRP, who are salivating at any hint of use in production applications, and bankers, who will absolutely not risk offending the regulatory agencies within their various international locations. My own background is from consulting. Although I didn't play a direct role in the strategic side of the business, I participated occasionally in proposal writing and other marketing activities. One type of customer that we marketed to and dealt with was government agencies. Government agencies are very conservative as well, and when I first participated in marketing new systems to them we had to emphasize how we planned on minimizing their risk exposure. If a customer doesn't hear the right soothing words in some of these conservative industries, they will not implement new technology. It was clear during SWELL that this was the case, and the regulatory uncertainty around usage of digital assets like XRP is still an issue. Ripple foresaw this conundrum at some point during its history and made the decision to ease banks into crypto, but only if and when they were comfortable. It did this by creating a solution built on the Interledger Protocol, or ILP. xCurrent allows banks to interact with any other bank ledger that supports ILP. 4 Yes, it can process any fiat value, even XRP, but it doesn't require XRP. When banks have reached a minimum comfort level, and regulators have finally issued guidance about digital assets, Ripple is perfectly positioned to activate widespread use of its digital asset within the banking industry. Why Would Banks Use XRP? This chart indicates that the first step banks take with Ripple will save them 33%. They can remain at this level of cost savings if they wish, as it clearly saves them a tremendous amount of money. But to access further cost savings, banks will need to activate usage of XRP and xRapid. Usage of XRP is projected to save banks from 42% to 60% (high and low volatility, respectively). "..three of the top five money transfer companies worldwide will be implementing Ripple’s XRP token in their payment flow systems in 2018." While they were restricted from making any official announcements of specific names of those additional two partners, this development indicates that Ripple is executing successfully on its corporate strategy, and is making incredible traction in promoting the use of XRP to lower the cost of international payments. The progression built over a series of four months. The Cuallix announcement came first. Then, a few days later, the SWELL conference unequivocally positioned Ripple as the modern alternative to SWIFT for the correspondence banking industry. SWELL was then followed by the Central Bank Summit, which solidified Ripple's reputation as the leader in blockchain technology for real-world commerce. 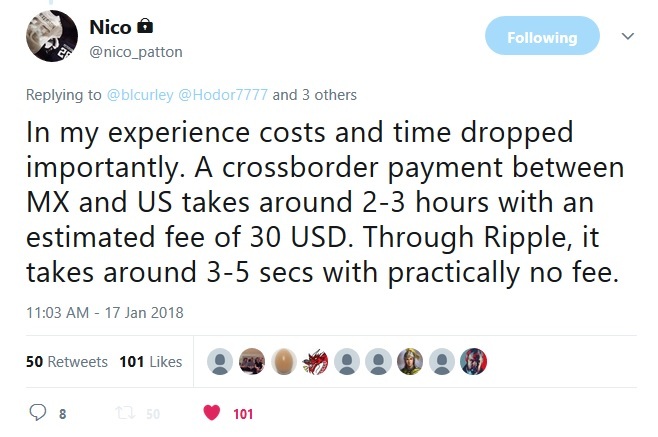 This progression continued in November with the announcement of American Express as a Ripple customer; while not specifically using xRapid out of the gate, Ripple indicated that XRP use was planned "down the line. "11 Then in January 2018, it was revealed that MoneyGram would be trialing xRapid as well. And then on January 17th, Cuallix, after using xRapid in production, formally confirmed that the cost savings were verified, and provided their positive endorsement of using xRapid via twitter 12 and a formal announcement on the company website. With Cuallix's formal confirmation of the cost savings for XRP, the scales have now swung. In confirming xRapid's use in their business, and that the cost savings associated with using XRP are tangible and measurable, Cuallix's announcement was the final pebble in the pile that swung the scales. Up until now, crypto investors have been investing based on possibilities, and also on the reputation of Ripple for innovative and high-tech solutions. Now, however, the reason for investment rests on measurable results tested in production conditions - this is a stage of adoption that almost every other fintech start-up dreams about. It is at this point that the nature of Ripple's business, and also XRP's future in crypto, is solidified. The naysayers have been visible on Twitter, Reddit, and other social media platforms as XRP challenged Bitcoin in early January for leadership of the cryptoverse. Some of these naysayers have entrenched financial interests that rest on Bitcoin's prominence in crypto, and upon its now-dwindling market of retailers that accepted it as payment. But high fees, little-to-no scalability, and governance issues at every turn have hampered Bitcoin's continued use in real-world commerce. Instead, all eyes are now turning squarely on the cryptocurrency that excels at speed and scalability; the one that financial institutions are most likely to adopt first: XRP. For those XRP investors that have purchased XRP recently, the most difficult action will be to do nothing. In crypto, buying and holding an investment is sometimes the most difficult accomplishment, as we've seen recently with the entire market backslide. 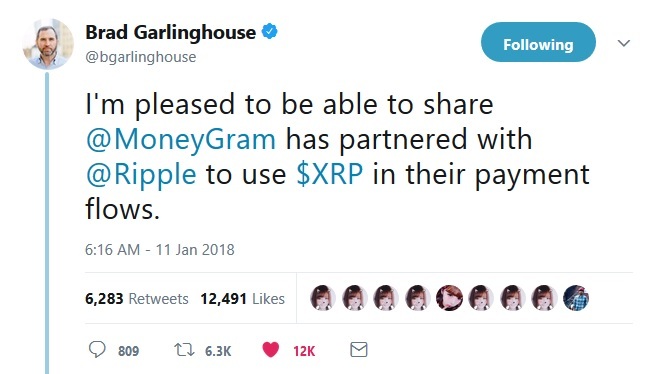 But when an investor purchases XRP after doing their own due diligence, they should rest easy knowing that a massive Silicon Valley company is fully supporting the business adoption of their chosen currency.